There's certainly no shortage of pubs for the after-work drinker to head to in this area of Fitzrovia. It just so happens that one of them is also called The Fitzrovia, though it mustn't be confused with the historic Fitzroy Tavern (a Sam Smith's pub not very far away, down Charlotte Street), which is the pub that actually gave the area its name (and, fading with the passing years, its reputation). 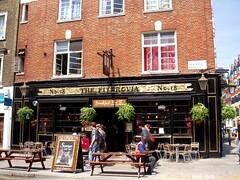 The Fitzrovia is a fairly standard Taylor Walker (Punch Taverns) pub situated in a single room with a bar at the back. Half of the seating is at high tables; the other half is normal chairs and tables. On both our visits (a Tuesday evening in January 2008 and a Monday evening in March 2011) there were empty tables available at 6pm, so it didn't get too crowded (though it was busy). Music was playing, but too quietly to tell what kind. There are four handpumps on the bar, offering London Pride, London Gold (£2.85/pint), and Greene King IPA on a March 2011 visit (the other pump had a Bombardier clip and an "in conditioning" sign). On our previous visit, in January 2008, only two of the handpumps were in action, with London Pride and a well-kept Deuchars IPA. On our first visit, the bar staff were friendly and any slowness was only due to a new member of staff who had clearly started that day, though there was minimal attention to table service (our food plates and empties remained there for the duration of the visit). On our second visit, there was again a rather inexperienced member of staff on duty, though he was very keen and friendly, made sure to clear glasses regularly, and warned us when we ordered the London Gold that another customer had complained about it (there was nothing in fact wrong with it). According to the Taylor Walker website as of March 2011, food is served 10am-10pm Mon-Sat and noon-9pm Sun. The food itself is a standard menu which we've seen elsewhere (includes burgers, steaks, "posh" egg and chips, etc. ), and Ewan couldn't complain overly about the quality. In January 2008, the mushroom burger was tasty and had a decent quantity of chips; providing mayonnaise and condiments was quick and done without fuss. Accessibility: A ramp to get in. All on one level once you're in. Half of the seating is at high tables, but the rest is normal. There is a toilet with a wide door marked "easy access toilet" (we didn't check this, but it's a good thing it's there as the cubicles in the ladies at least are a bit of a squeeze to get into). Last visited by Kake, Ewan, Sarah, and Alice, March 2011. Opening hours and food times taken from the Taylor Walker website, March 2011. Last edited 2013-05-10 07:10:08 (version 12; diff). List all versions. Page last edited 2013-05-10 07:10:08 (version 12).